I got this recipe in an email from my dear Mama (said like in Downton Abbey, my obsession at the moment) who in turn tasted the dish at a friend’s house. So I am afraid I don’t know the original source of the recipe. But that doesn’t matter, because it is really easy to make and very tasty. Dear Mama only emailed me the ingredients, so below is my version of the dish. 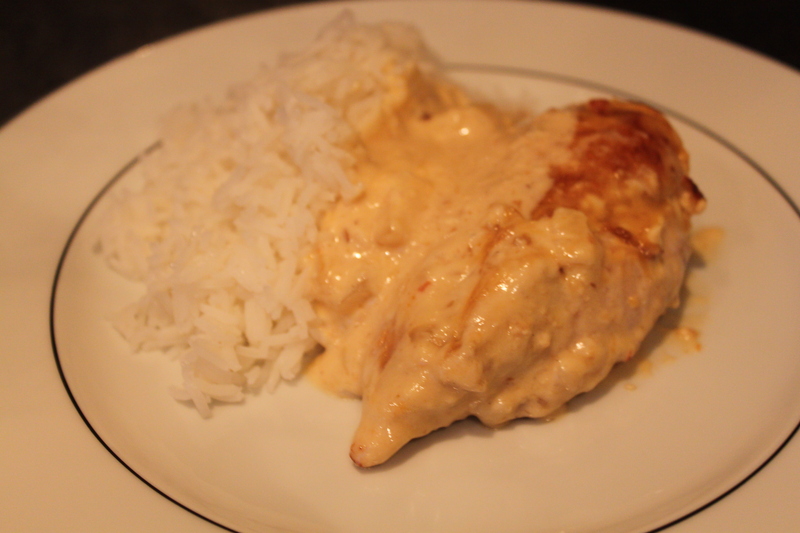 I know I usually recommend chicken thighs for more or less every chicken dish, but not this one actually, it works better with chicken breasts here, and they are anything but dry cooking in the cream. Brown the fillets in butter/oil until golden brown. Add salt and pepper and place in an ovenproof dish. Mix the other ingredients in an saucepan and bring to the boil. Let it thicken for a few minutes and pour the saue over the chicken breasts. Place the dish in the oven, 200C for 15-20 minutes or until the chicken is cooked. Serve with steamed rice and vegetables (i.e. broccoli).